Scripture: Shadrach, Meshach, and Abednego foreshadow the Christian martyr alongside the prophets. There were no Jewish Martyrs in the Bible (that I can think of) until the prophets. 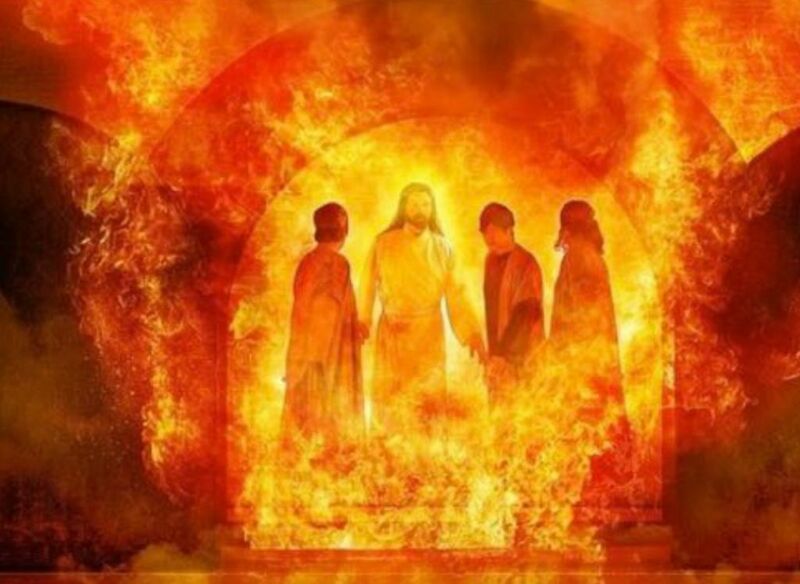 Even, in this case, these three men escape the fiery furnace with God's help and to God's glory. We see in those three men a love for God that surpasses the love of their own life. They believe in a living God and were willing to entrust themselves to God to be saved and committed themselves to die if they would not be saved. This level of faith and love is paramount to Christ's message to us in the Gospel. Jesus identifies Himself as the source of truth and famously said, "the truth will set you free." It is Jesus who says that if we sin we are slaves to sin. A slave is not equal to the family and does not remain in the household. So sin separates us from the Family of God. It takes an authority in the house, like the Son, to set the slave free; that is Christ's mission. Core Faith Principle: Imagine a slave who simply ignores his emancipation and goes about toiling in the fields everyday without missing a day. The farmer tells him again and again that he is free and doesn't have to work on this farm anymore. The slave won't be moved and dies in the fields he sowed. So it is with us. It is one thing for us to acknowledge that Christ has set us free with his Holy Cross, but it is another never to truly except it and leave the farm. The farm may be what we know best, the farm may include comfortable routines, little validations, and the bold notion of total freedom may be scary. So, just like the Hebrews who escaped from Egypt we can be cowards in our attempt to accept emancipation from sin. We can complain, "Why have you taken me away from Egypt..." where at least in my sin I had simple pleasures. At least in my sins I felt like I had some control. Just like a person who freely smokes cigarettes in the beginning ends up being coerced by the cigarettes later, so it is with sin. The feelings call and compel like a master's whip (the feel of the moment's pause between inhale and exhale, the taste of that certain food, the pleasure of a certain sight, the thrill of control over others, etc.). It is not enough that the Son sets the slave free, we are called back to easily to slavery. How many who have believed and received redemption from Christ turn back and do not carry it to their death? They live free for a time only to die among the slaves again? That is because they fail to receive the second offer and live it. The second offer is adoption into the family itself. It is not enough to escape slavery but it is equally as necessary to belong to a family where every offering of labor is in love to its members. To build up the glory of the family whereas every moment of labor is both a full self gift to the family, but because you are now part of the family, the mutual self gift of the other members means that everything produced belongs to the family. Like father said to the prodigal son's older brother, "all I have is already yours." Living this at Home: Believing lies is just as controlling for a person as a willful sin. In the case of being taught false doctrine or having a conscience formed by poor teachers or examples removes a level of responsibility from the sinner. Though they may not be responsible, like catching a disease, it doesn't mean there is not great suffering that occurs from that faulty lesson or faulty formation of conscience. We send our children off to school each day where other adults have an authoritative role in forming your child's disciplines, conscience, and perspective on the world. It is critically important that parents take great care to reinforce the values of Life promoted in the Gospels by our Lord Jesus Christ. It is not just school but culture as well, the tv shows, movies, etc. How are they forming your child's conscience? What sins are they trying to enslave your children into before they are wise enough to say no? It is impossible for Sunday school to fill those shoes at a maximum of 20 hours a year. You must be the conduit of the Gospel message for your children. Distinguish between the culture of the Kingdom of God which we belong and the culture of our earthly country. We have to teach our children that we can be dual citizens, but when we have to choose, we always choose the Kingdom of God like Shadrach, Meshach, and Abednego. Jesus has shared the truth with his disciples, us, once freed from sin, once committed to the family, the burden of this truth is light. A Further Thought: I'm getting carried away, but consider all of the dystopian media that is out there. There are no more bold and righteous heroes, who take joy in doing what is right. Now we see nothing but characters who are oppressed in some manner always held down, always having to some additional force holding them down despite all the victories they may achieve. This is the media of sin. They are sad and lifeless tales. The Christian IS SET FREE when you and God are ONE what power has authority of you? What dystopia can hold you? No, the Christian life unlocks the fullness of human potential, it unlocks a love unmarred by selfishness, it unlocks the life that can give everything so as to receive everything. Jesus tells Pilate, "You would have no power over me, were it not given you from above." And so it is for us. Nothing, not sin, not government, not culture, or anything else has power over us beyond what the Lord has chosen to subject us to. Therefore the Government can tell us we can't go through stop signs, the Lord has ordained the authorities for purposes like that. However, should the country we abide in conflict with that of the Kingdom of God, we are free to follow the laws of the Kingdom at the expense of the Country. We were not made for the sad, bitter, culture in which we live, where daily we hear lies and accusations of liars, where we hear of crimes but see no punishment, where people are hateful and divided, where false accusations are flung without consideration, and bearing false witness has been erased from the 10 commandments which have been taken down from the public squares and hidden. You and I, we are set free. Our mission, is to preach and welcome others to the joy and freedom we have in Christ. Preach it Matt! What a great message of joy!